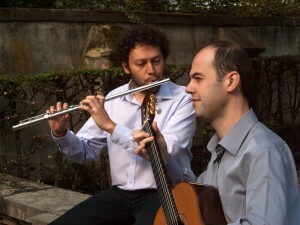 André Simão and Gustavo Mendoza (flute) perform classical music, Latin and Brazilian music. They are in different sense neighbor (vecinos) by their countries of origin Brazil and Colombia, which have a common border, and because they live in the same district of Nuremberg. Gustavo Mendoza graduated from the Academy of Music in Nuremberg, where he had as tutor Marcos Fregnani-Martins, flutist with the Bamberg Symphony Orchestra, and he is working both as a concert musician and as a music educator.